John David Dingell, the longest serving United States’ Congressman in history, and one of the House's most powerful chairmen, offers a unique, unforgettable, and refreshingly candid behind-the-scenes account of government and politics over the past eighty years. Democrat John David Dingell served in the U.S. House of Representatives for fifty-nine consecutive years, from December 13, 1955 to January 3, 2015—the longest tenure of anyone in Congressional history. The son of a Congressman, Dingell worked in his father’s office from childhood and became a house page in 1938, when he was just eleven years old. Retiring from Congress at eighty-nine, he has witnessed some of the most significant events that have shaped our nation and the world. In The Dean, Dingell looks back at his life at the center of American government and considers the currents that have reshaped our Congress and America itself, from his childhood memories of wartime Washington during the FDR administration, through the Reagan Revolution, to the election of the first black president, Barack Obama. 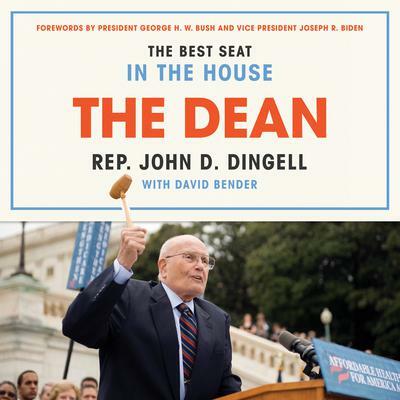 Rife with a wisdom that literally only Dingell can possess, The Dean is the inspiring story of some of the greatest congressional achievements, of which Dingell was an integral part, and of the tough fights that made them possible. Dingell offers a persuasive defense for government, explaining how it once worked honorably and well—in defeating Hitler, sending us to the moon, ending segregation, and providing for the common good of all our citizens. He argues that to secure our future and continue our progress, we must work together once again—lessons desperately needed today. John David Dingell, the longest serving United States’ Congressman in history, and one of the House's most powerful chairmen, offers a unique, unforgettable, and refreshingly candid behind-the-scenes account of government and politics over the past eighty years. Democrat John David Dingell served in the U.S. House of Representatives for fifty-nine consecutive years, from December 13, 1955 to January 3, 2015—the longest tenure of anyone in Congressional history. The son of a Congressman, Dingell worked in his father’s office from childhood and became a house page in 1938, when he was just eleven years old. Retiring from Congress at eighty-nine, he has witnessed some of the most significant events that have shaped our nation and the world. In The Dean, Dingell looks back at his life at the center of American government and considers the currents that have reshaped our Congress and America itself, from his childhood memories of wartime Washington during the FDR administration, through the Reagan Revolution, to the election of the first black president, Barack Obama. Rife with a wisdom that literally only Dingell can possess, The Dean is the inspiring story of some of the greatest congressional achievements, of which Dingell was an integral part, and of the tough fights that made them possible. Dingell offers a persuasive defense for government, explaining how it once worked honorably and well—in defeating Hitler, sending us to the moon, ending segregation, and providing for the common good of all our citizens. He argues that to secure our future and continue our progress, we must work together once again—lessons desperately needed today.